It’s been a while since I’ve shared a “best books list” here on the blog. This year we’ve had homesteading on the brain in a major way, so I’m excited to present a collection of our favorite books for homestead kids. Sometimes I think I may have missed my calling as a children’s librarian. Thankfully, homeschooling my own children through various ages and stages provides the perfect excuse for indulging my inner kiddie-lit nerd. Serving as my family’s own live-in librarian gives me the freedom to stock our home library with beautiful books that speak specifically to the people who live in my home, and to our unique way of life. I love to go on treasure hunts, tracking down special books to add to our collection. At Christmas, each child in my family receives three gifts (and one big joint gift). For one of their three individual gifts, they automatically expect to receive a box of books. Filling that box of books is one of my favorite Christmas preparations. I go into book sleuth mode, researching and tracking down special books for each boy. Where are all the great books for homestead kids? This year, following our move to the new farm and mirroring our family’s journey deeper and deeper into the world of homesteading, each boy received several books along those lines. 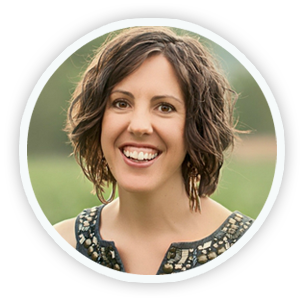 As I searched for excellent books that celebrate homesteading, farming, growing food, and the agrarian way of life, I found a shortage of recommendations in this area. Most farming books are the cutesy Old MacDonald type, or they celebrate “big ag” with monoculture farms, huge combines, and mass produced livestock. Instead, I’m looking for books that portray the small, diversified farm (otherwise known as a homestead); sustainable agriculture; and slow living; which of course led to a family pow wow to list our favorite homestead books for kids. Whether you live on a homestead, want to homestead some day, or just want to expose your kids to the beauty of growing food and living off the land, I hope you’ll love our favorite books for homestead kids as much as we do. Each book listed below celebrates some aspect of farming or producing food. I’ve divided the list into three parts: picture books, chapter books, and a few bonus books. Perfect for the littlest homesteaders, and you may be surprised at how much your older kids will love these picture books, too. A simple book about growing and selling apples. So many things to love about this story! For our homesteading purposes, it follows the process of turning sheep’s wool into a new coat: shearing, washing, dyeing, weaving, sewing, bartering. And at the end: gratitude and hospitality. A month by month tour of an Australian family’s farm, where the seasons are reversed from our seasons in the U.S.
Any time we pick fruit of any kind, someone in my family references this book, from “kuplink, kuplank, kuplunk” to “run along and pick your own berries. Mother wants to take her berries home and can them for next winter.” It’s a classic! The adventures of field mice in the miniature world of Brambly Hedge, with detailed illustrations. A heartwarming tale of Appalachian siblings who plan to raise and sell turnips for money to buy shoes. A classic collection of animal stories from the real life experiences of an English country veterinarian. Two of our most prized books. 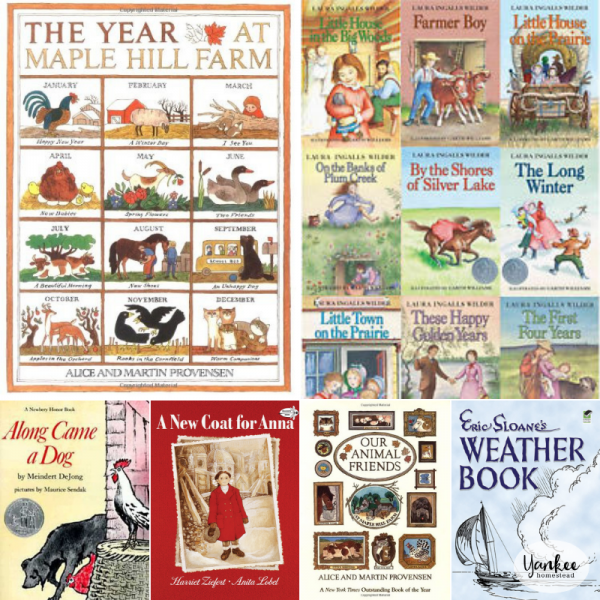 Wonderful illustrations with humorous and engaging descriptions of the seasons and animals of Maple Hill Farm, where the married author-illustrators lived in New York. I’m on a mission to track down every farm-ish book written by the Provensens, like this one, this one, and this one. A beautifully illustrated account of an early-19th century family in rural New England. We adore this book! We own Dunn’s entire collection and each of my boys has loved these animal stories from the approximate ages of 2 to 6. Perfect for family read-aloud sessions or audio listening in the car. A sweet story of the friendship between a lone man, a little red hen and a homeless dog. An exciting tale of early pioneer life. We debated whether this book belongs on this list of favorite books for homestead kids or our upcoming list of outdoor adventure books. In the end, we included it on both lists! Inspired by true accounts from the life of the author’s grandmother, this pioneer tale is filled with action, adventure, and family values. The classic story of a (humble, radiant) pig and those who love him. Even though the Peppers do not live on a homestead, my crew decided that their lifestyle and pluck earns them a spot on this list. The five little Peppers are homesteaders at heart. Another heartwarming tale with a female protagonist that even your boys will love (mine did). We could all relate to Heidi’s love of her mountain plants and animals and her homesickness for them while she was forced to live in the city. I hope you won’t think it silly when I say that these true stories of the Ingalls and Wilider families have left a deep mark on my family. Homestead family or not, the character and grit of these pioneer families will bless your life! This beautiful story starts out slow, especially for boys, but by the end they will cheer and possibly cry for the young protagonist. Our entire family (eventually) loved this story! This one is next on our list, with rave reviews from fellow homesteaders. We’re currently enjoying Sloane’s weather book (below). I can’t believe it took us this long to discover author Eric Sloane! We’re diving into his weather book first, because our knowledge in this area is embarrassingly slim. This book is on my wish list! It’s out of print and currently sells for about $50 online, so I’m holding out hope to come across it one day at a book sale or used book store. There you have it! My family’s favorite books for homestead kids. What would you add to our list? Thanks for this great list! I’ve never come across someone else that has read Five Little Peppers and How They Grew. That book was a childhood favorite and I still have a copy of it! One book your boys may really like is Canyon Winter by Walt Morey. It’s about a boy in a plane crash out in the middle of no where and he is found by an old man that lives off the land in the middle of no where. He isn’t able to get out of the canyon until spring melt and old man teaches him how to survive. That does sound like a story we would enjoy; thanks for the recommendation, Victoria!